14 July 1967 First flight. 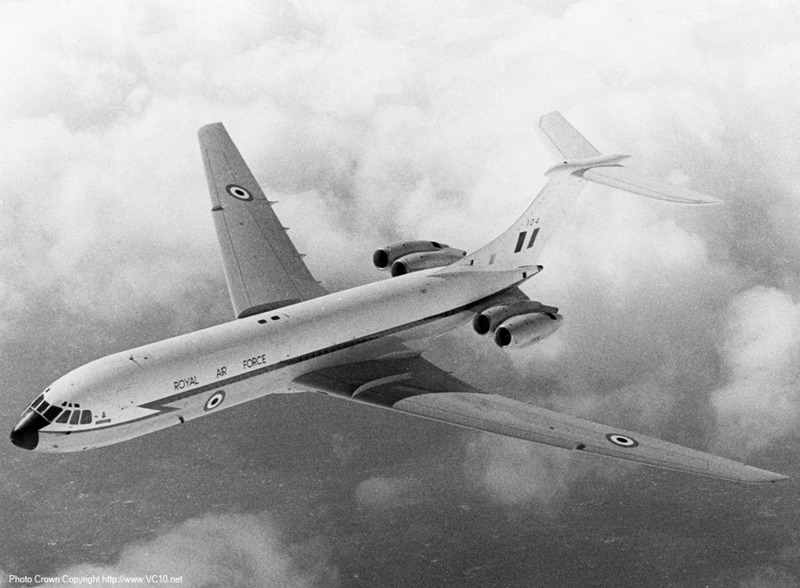 3 August 1967 Handover to RAF 10 Squadron as XV104. 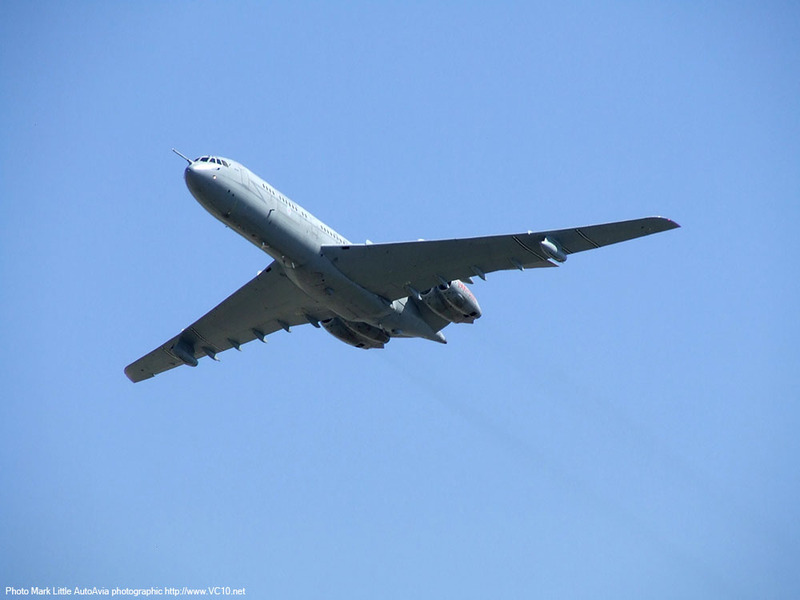 11 November 1968 Named 'James McCudden VC' in a ceremony at RAF Brize Norton. 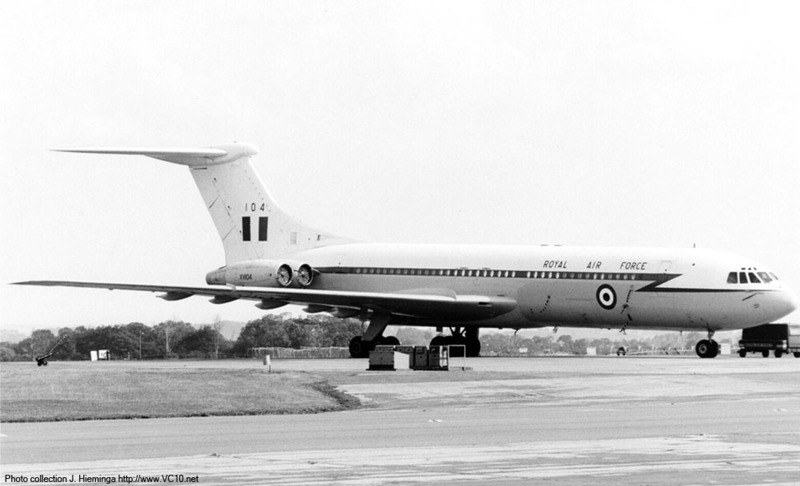 May/June 1972 Carried the body of the Duke of Windsor from Paris to RAF Benson. 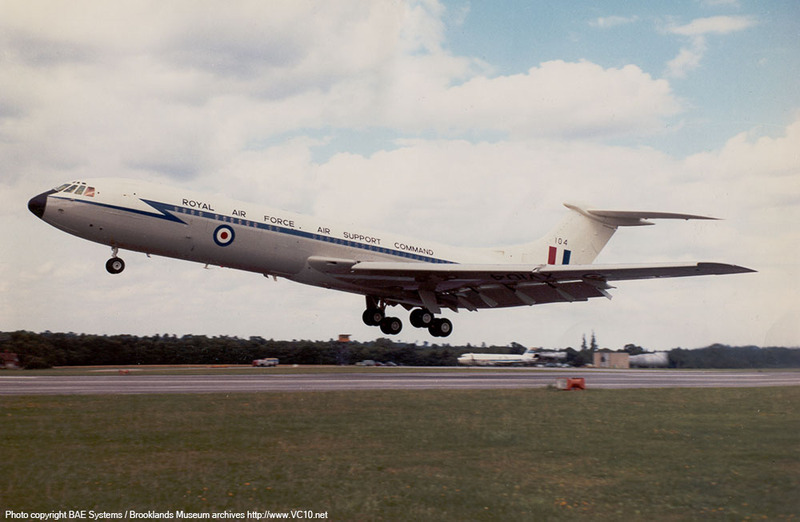 29 July 1977 Took part in Royal Review flypast at RAF Finningley. 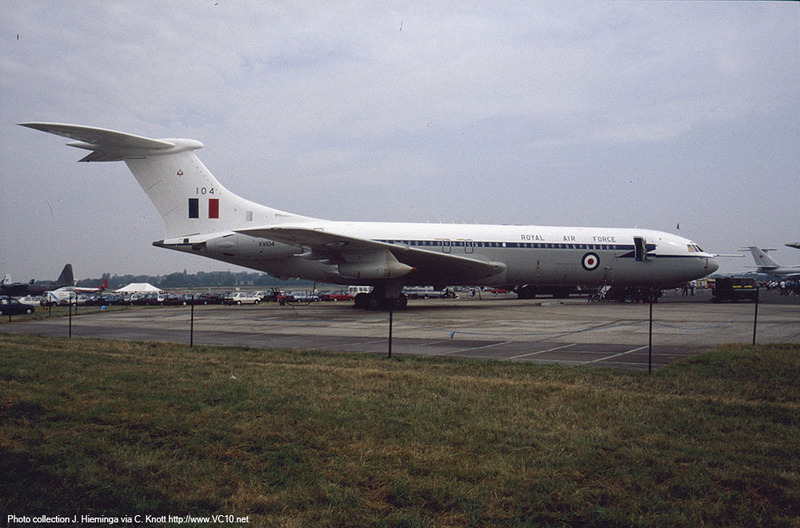 19 June 1982 Carried wounded soldiers from the Welsh Guards and 2/3 PARA from Montevideo to RAF Brize Norton. 7-8 October 1991 Journalist John McCarthy was flown home to the UK after five years as a hostage in Lebanon. 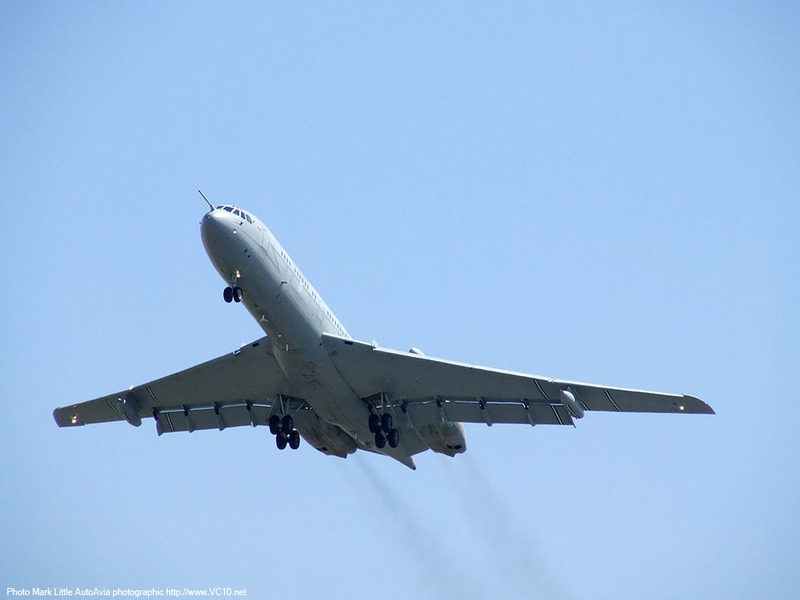 9 February 1994 First flight after conversion to C1K tanker/transport. 14 February 1994 Delivery to 10 Squadron as C1K. 1999 or 2000 Repainted into the new grey colourscheme. 14 October 2005 Transferred to 101 Squadron upon disbandment of 10 Squadron, allocated letter 'U'. 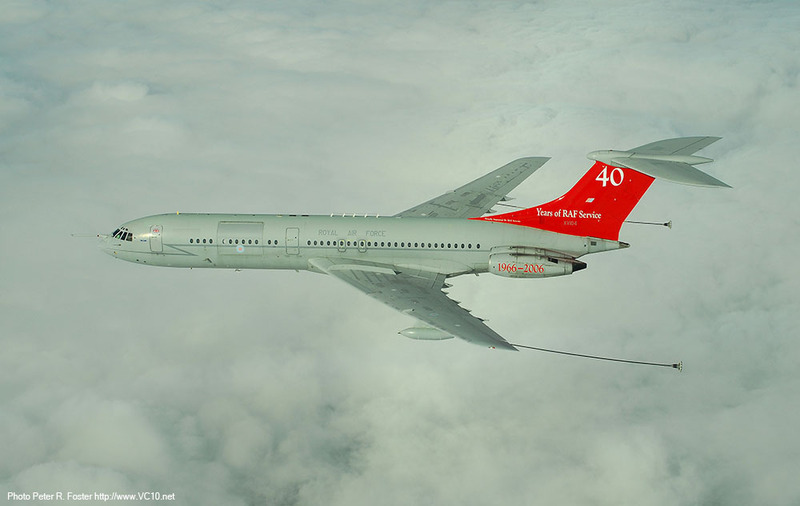 July 2006 Carried special tail artwork to celebrate 40 years of VC10 operation. 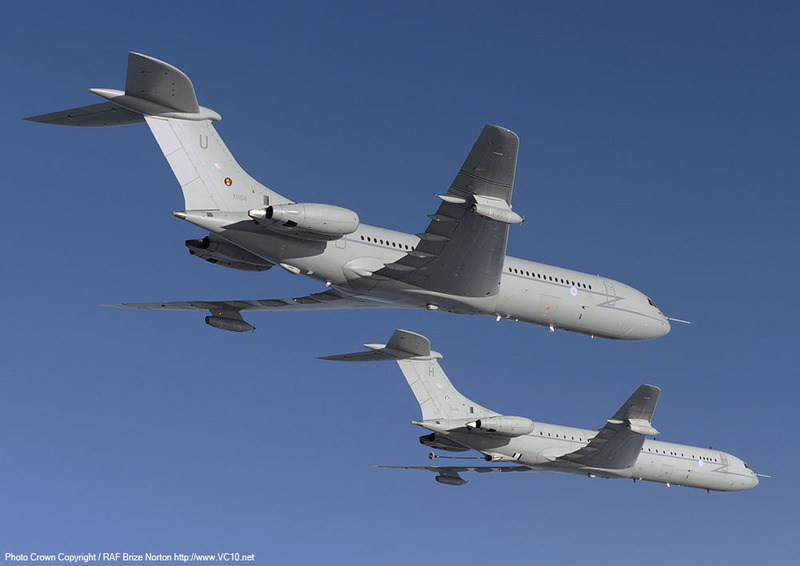 14 July 2006 Flew over Brize Norton in a special three-ship formation to celebrate 40 years of VC10 operation in the RAF. 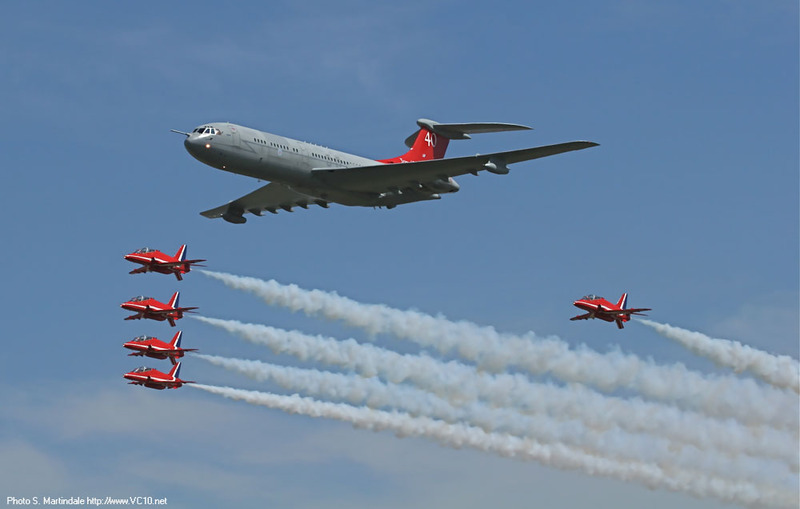 15-16 July 2006 Flew at RIAT 2006, a singleton flypast on the 15th and in formation with the Red Arrows on the 16th. Early 2013 Airframe scrapped at Bruntingthorpe, cockpit section retained and stored. 26 January 2019 Cockpit section moved to St. Athan. 1. 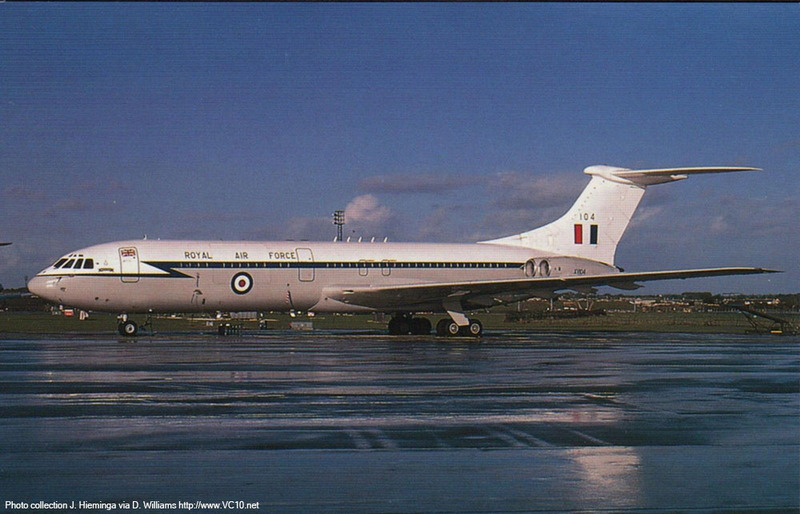 XV104 only spent a few weeks at Wisley for testing. This photo shows it taking off for one of its test flights. 2. 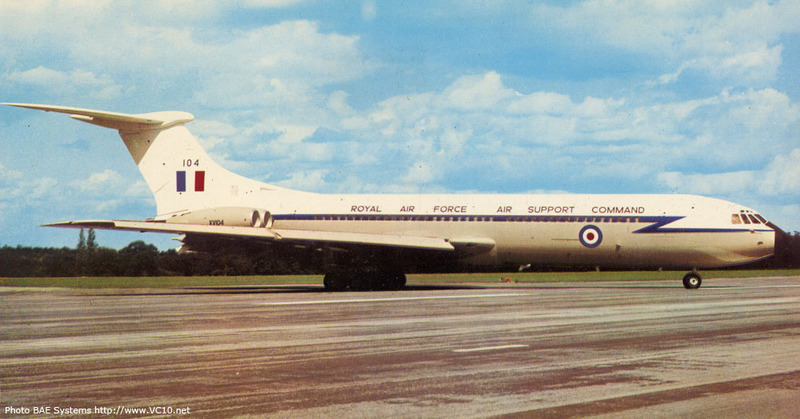 XV104 at the northern end of the runway at Wisley, this photo was on the postcard that was given away with each in flight package when the aircraft was first introduced. 3. This is the original image that was used for the postcard. 4. 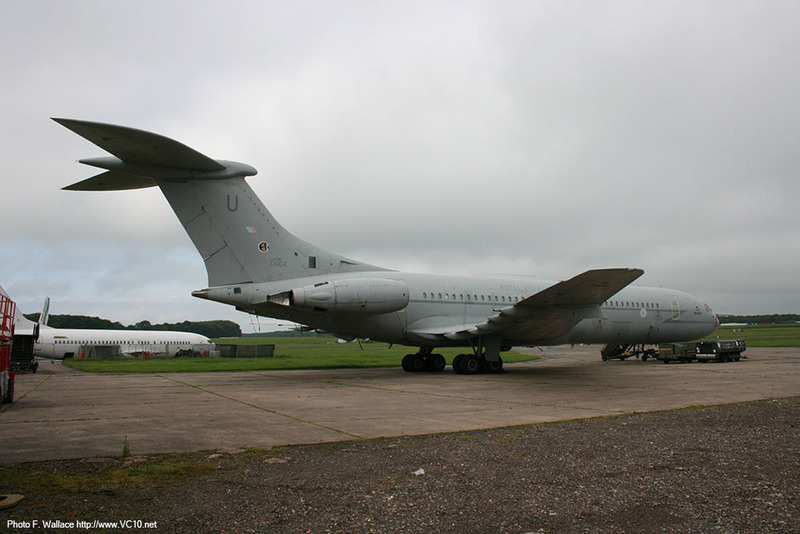 XV104 at RAF Brize Norton with other 10 Squadron VC10s. 1. 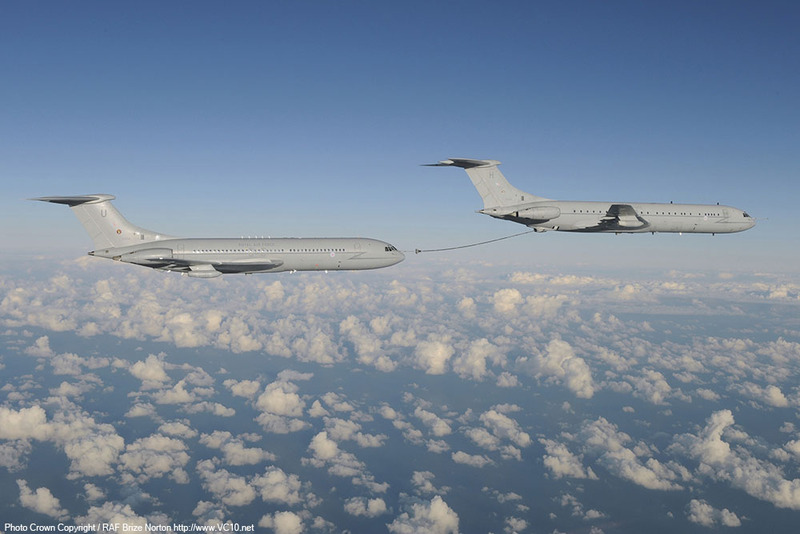 This dynamic air to air photo was sold as a promotional photo by the Ministry of Defence. 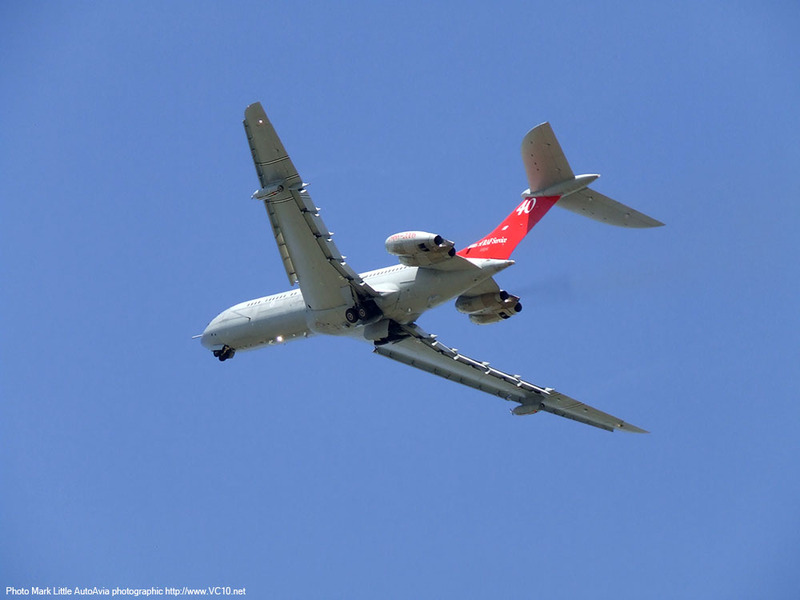 The nose radome is still black but the title on the fuselage has been shortened. 2. A few years later, the radome has changed to white and grey. 3. 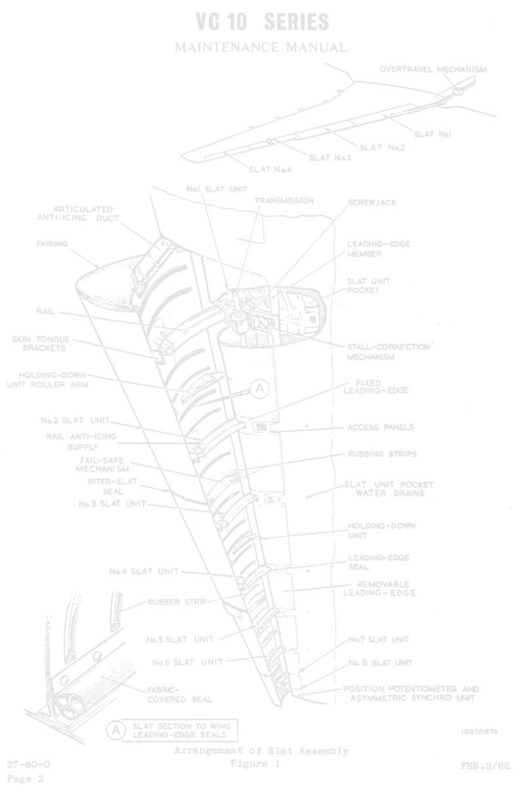 Almost the same configuration, but the 'towel rack' antenna on the fuselage spine shows that this is after the SRIM mods were carried out in the 80s. 4. XV104 at Fairford for the International Air Tattoo in August 1994. by now the conversion to C1K has added refuelling pods. 1. 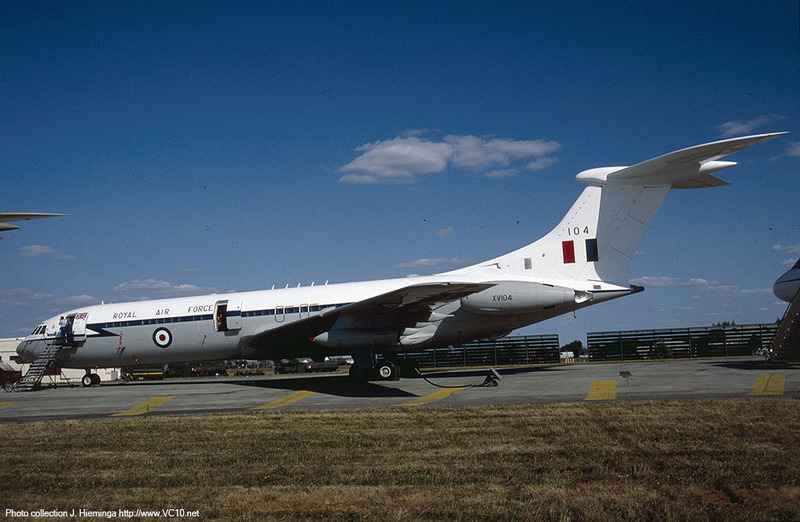 In July 1995 XV104 was at Fairford again for another IAT. 2. A decade later, with XV104 in the new grey scheme, formating on ZA149. 3. And moving into trail for some fuel. 4. 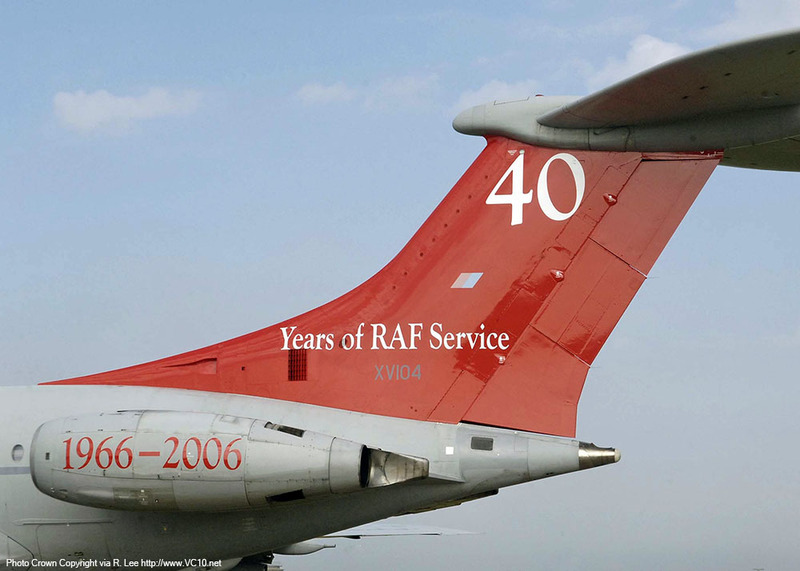 In 2006 XV104 received this special tail to commemorate 40 years of VC10 operations. 1. 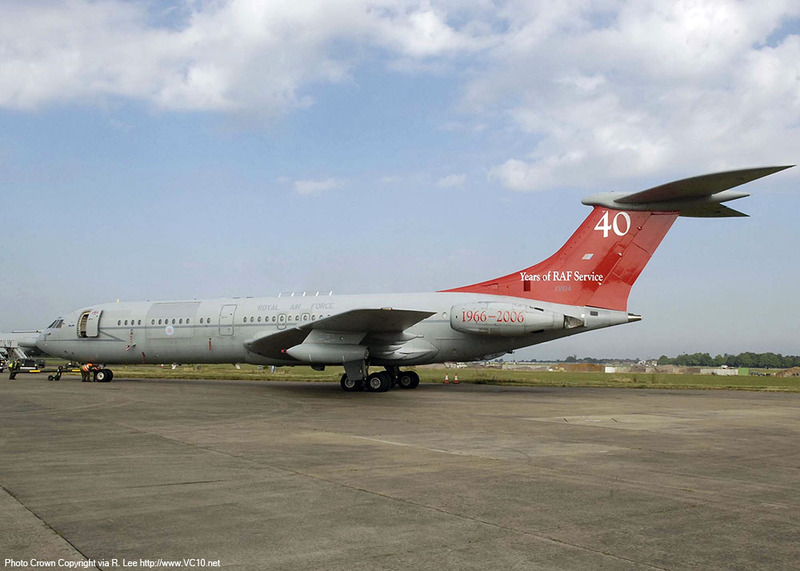 This commemorative scheme had a different side though, it made passengers boarding XV104 realise that they were flying on a 40 year old aircraft. 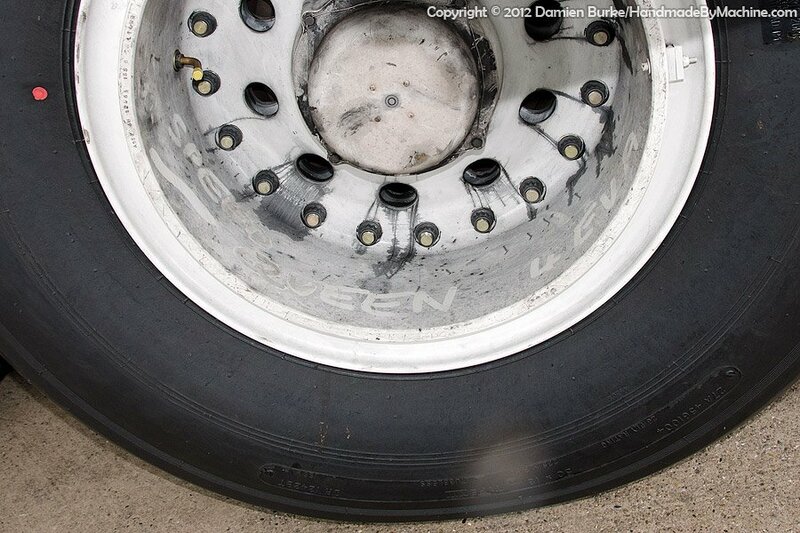 According to one pilot, not everyone was happy with this knowledge. 2-4. Flypast and low approach at an airshow, location unknown unfortunately. 1. 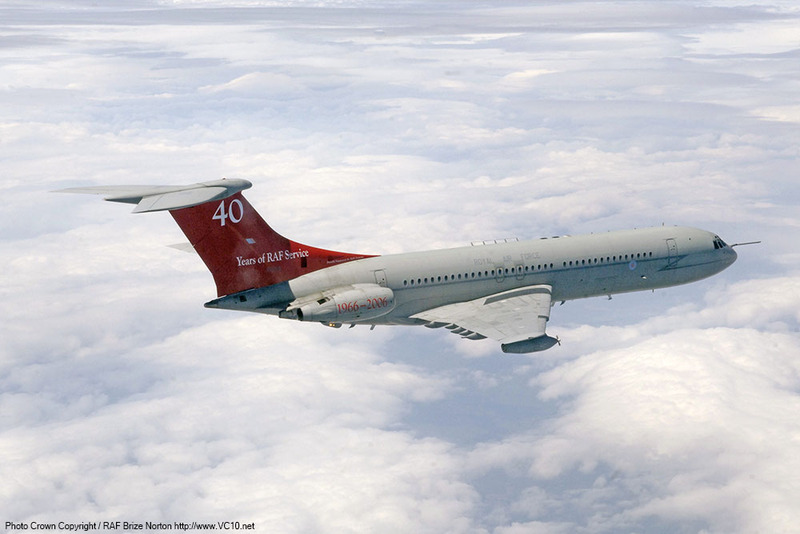 The red '40 years' tail was one of several special tails carried by VC10s in the noughties. 2. 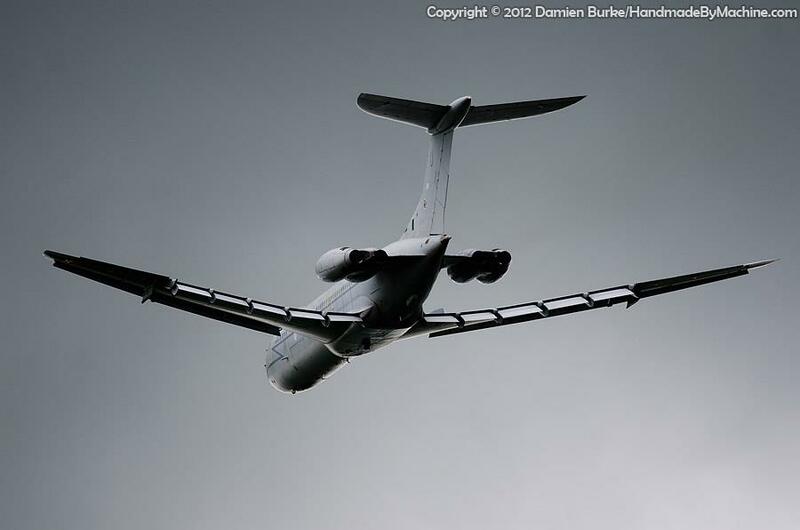 Peter Foster took this air to air photo of XV104, callsign 'Tartan 22' during a Wycombe Warrior exercise. 3-4. 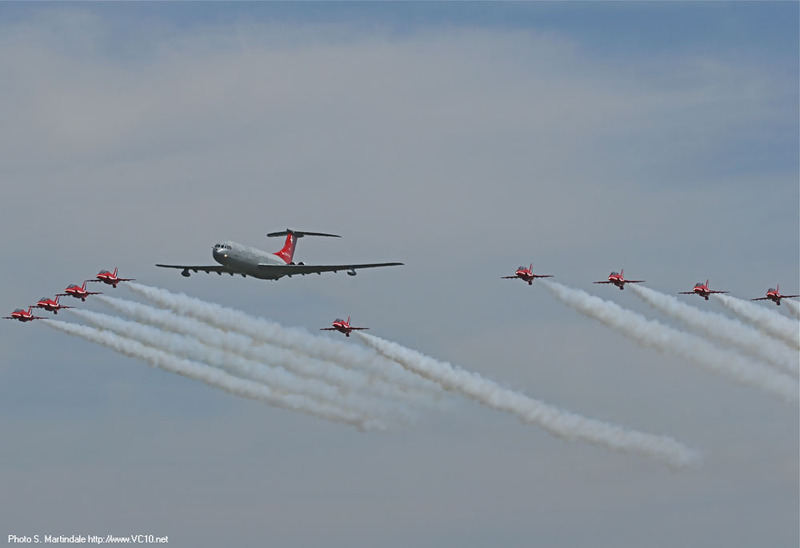 The icing on the cake was this special formation at RIAT 2006, on Sunday 16th July. 1. 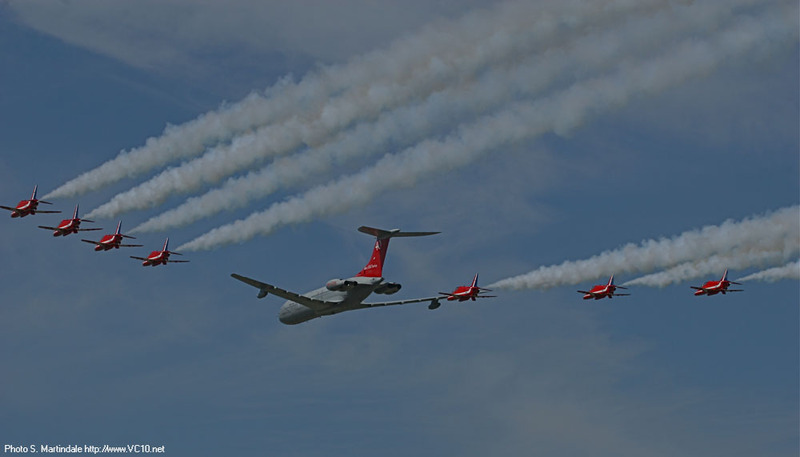 There are some iconic photos of, for example, a Concorde or Vulcan XH558 together with the Reds. These ones can be added to that list. 2. 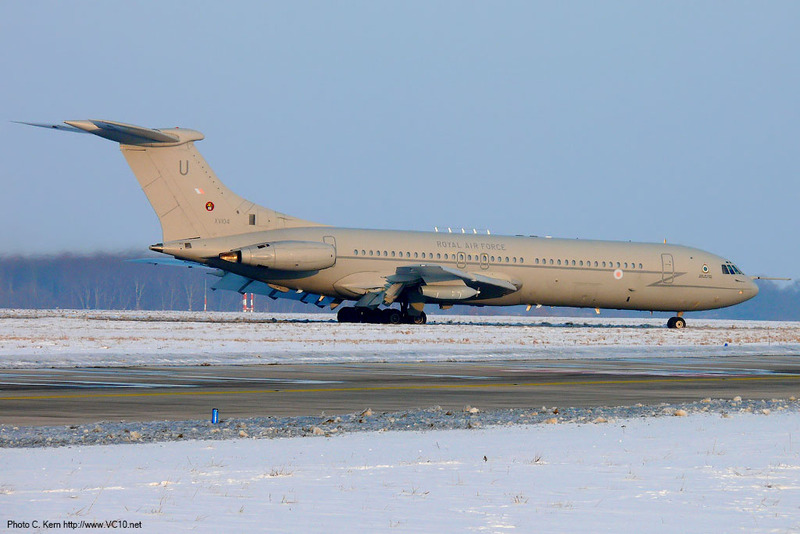 XV104 at Hannover airport on a cold February day in 2010. The red tail is gone but there is something else that is not part of the standard livery. 3. 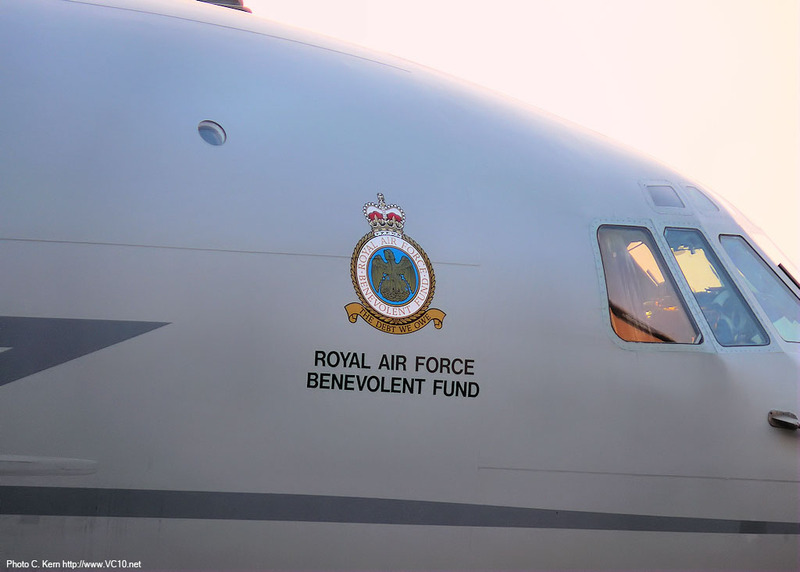 A close up of the RAF Benevolent Fund crest, this was applied to both sides of the fuselage, most likely after 104's participation in a fundraising event. 4. 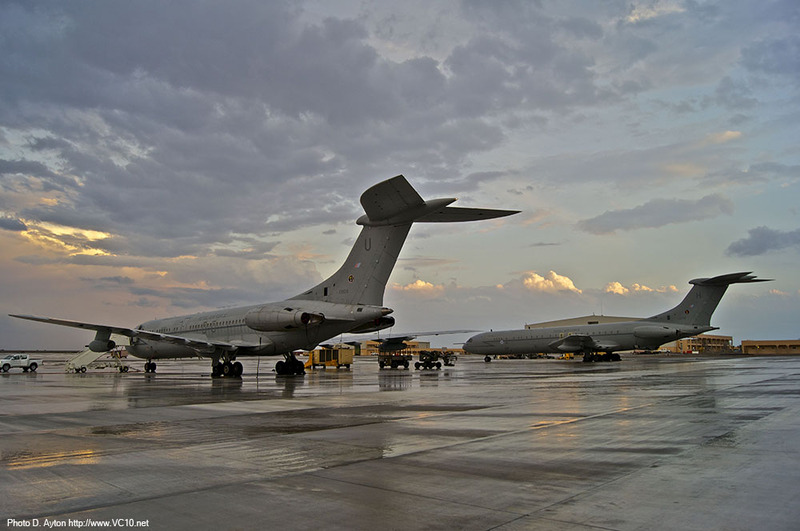 With less than a year to go until its retirement, XV104 was still active in the Middle East. 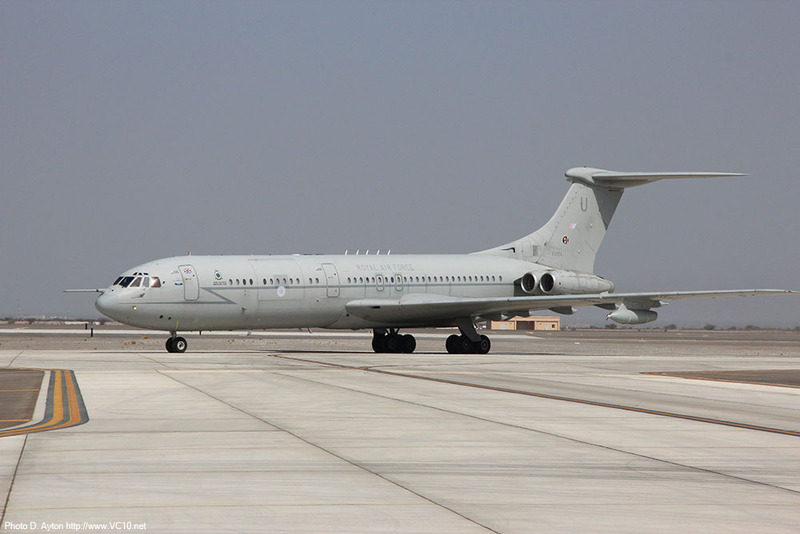 The VC10 is seen here taxiing at RAFO Musannah, in Oman, in October 2011. 1. Parked next to ZA149 in 2011. 2. 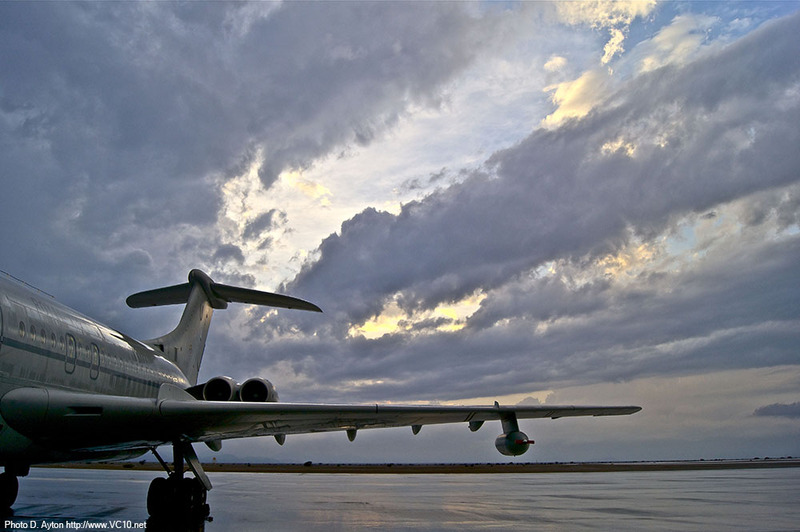 The lines of the VC10 airframe lend themselves well to atmospheric photos like these. 3-4. 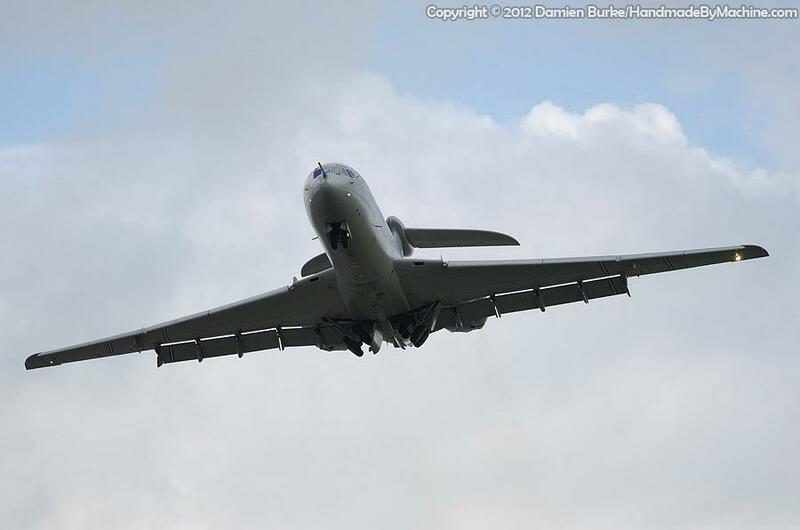 Damien Burke took this sequence of photos of the final flypast and approach for XV104 on 4th July 2012. 1. 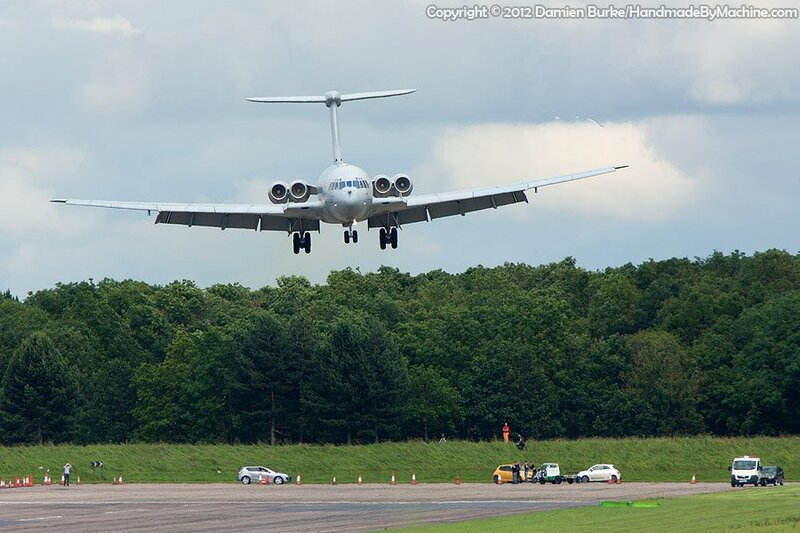 Damien Burke took this sequence of photos of the final flypast and approach for XV104 on 4th July 2012. 3. 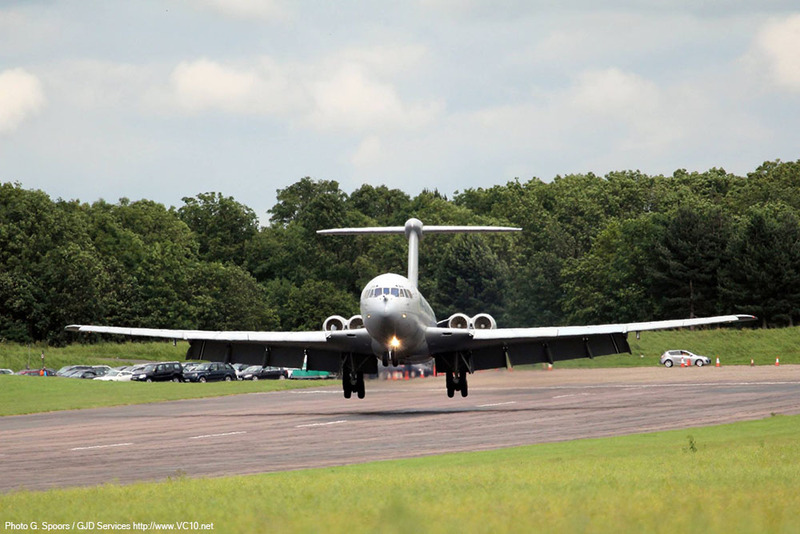 And touchdown at Bruntingthorpe. 4. 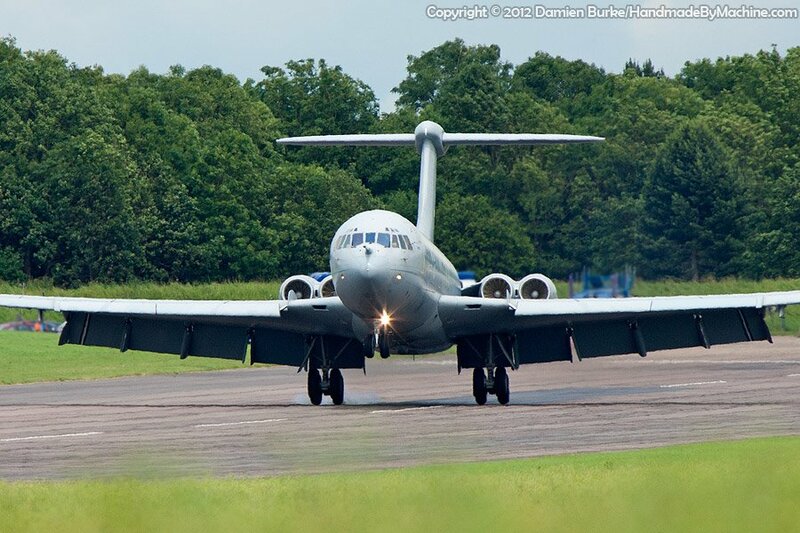 Taxiing in with several onlookers. 1. 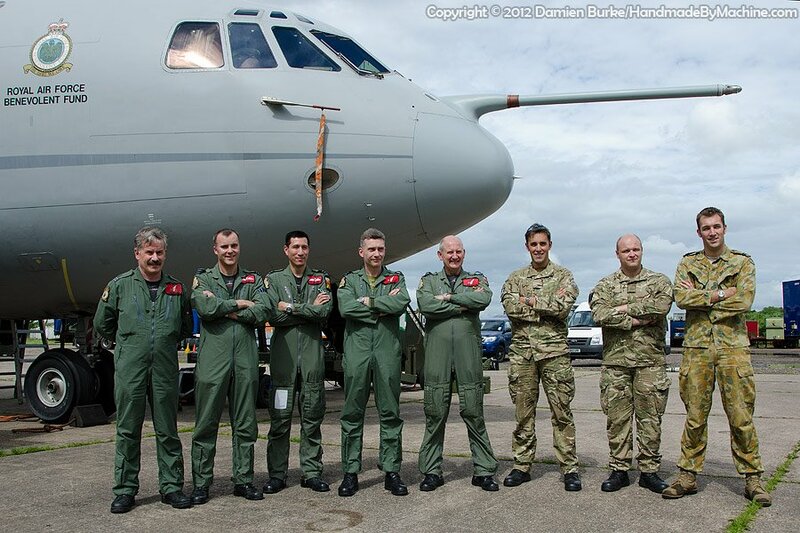 The crew for XV104's final flight to Bruntingthorpe airfield. 2-3. The ground crew left some messages behind. 4. 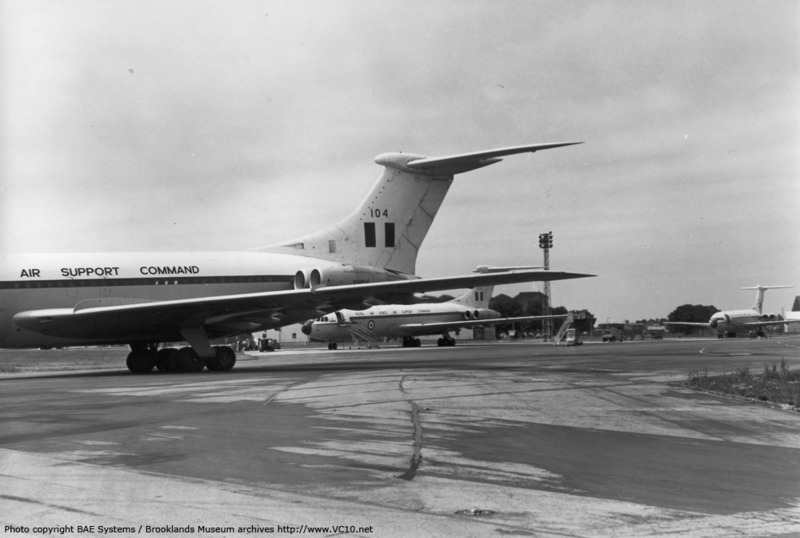 XV104 was initially stored at the airfield in a complete state. 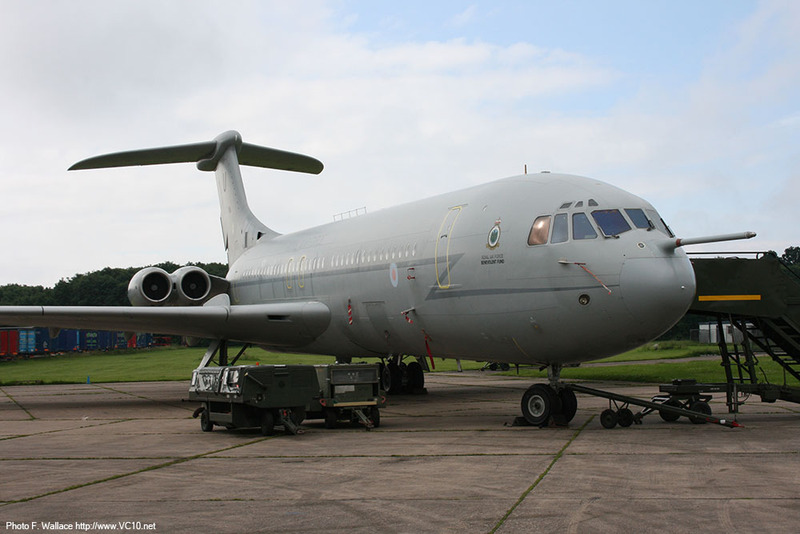 But early in 2013 the scrapper caught up with this VC10. 1. 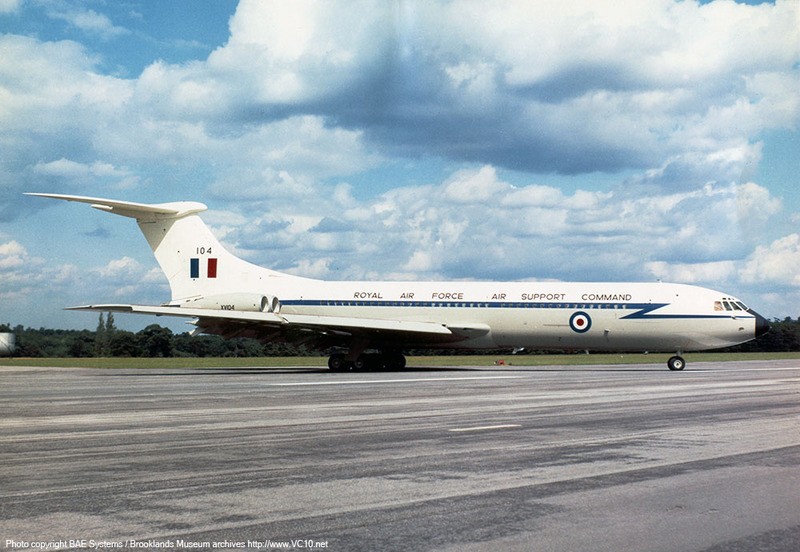 XV104 was initially stored at the airfield in a complete state. 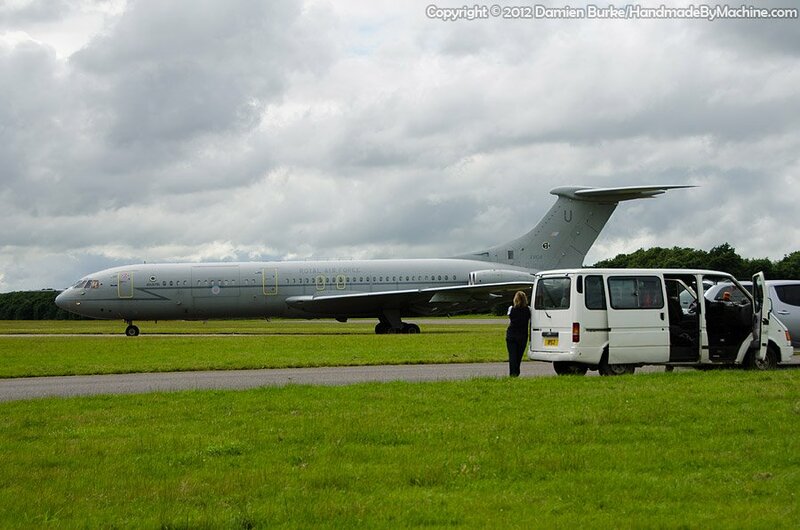 But early in 2013 the scrapper caught up with this VC10. RAF Same as above with red fin, '40 years of RAF Service' text and serial on fin and '1966-2006' in red on the engine nacelles.